Recently via the magic of e-mail, my cousin Sam Melchionne sent me a treasured picture of my grandparents. It was taken about 1940 in the side yard of their North 4th Street home. There is Sabino with his accordion, and Rosa, the image of my own mother, with her gentle smile. From the Italian mountain country of Avellino province (near Naples), in the town of Manocalzato, Sabino and Rosa immigrated to Newark, sometime in the 1904-1906 time frame, settling in the old Little Italy section. Soon they would raise 9 children, who would raise 30 of their own-we first cousins-and now there are probably 85 of us counting all the 2nd thru 4th cousins. All this from two people. It does make a rather dramatic statement about population growth, but love enters the picture as well, and we shouldn’t forget that. Sabino sold fruits and vegetables on the streets of Newark, peddling first by horse and wagon, and later by his old red and green Rio truck. Now almost 100 years later, as I drive the streets of the city every day, to and from work, I wonder if Sabino peddled those same streets, and what his eyes must have witnessed. When I pass the Colonnade apartment building on Clifton Avenue, I remember that his home on Drift Street sat where that large building now rests. When I look out from my downtown PSE&G office windows toward Sacred Heart Basilica (Cathedral), I can see St. Lucy’s Church, the last remnant of Little Italy, his beloved first home in America. I often wonder, and try to imagine, what Sabino’s eyes saw? What was his new life in America like? It’s 1906 now in my mind’s eye, and equipped with some historical knowledge of my old hometown of Newark and the surrounding area, I am going to try and visualize Sabino’s world; a world that some of your grandparents may have witnessed too. Trolley cars and horses prowled the streets, with clanging bells and hoof beats on cobble- stone or brick streets. Trolleys fed themselves from overhead electric lines, while horses donned oat bags; and unfortunately, the horses left their residue along the street or curbs. Many of the old steel poles for the electric lines still exist on Newark Streets. I have even seen metal hitching posts for horses, complete with a horse head and steel ring for the horse’s reins. Many houses were still probably gas lit, with electricity making inroads everywhere. PSE&G was only 3 years old in 1906, having been incorporated in 1903 by utility business tycoon Thomas N. McCarter. If you rode the trolleys, used gas, or powered with electricity, you paid his company for the service; and you still do today for electricity and gas. A short walk from his Drift Street home, and Sabino could see the Cathedral being built. The twin spires began rising about that time; and just to the west, a brand new Branch Brook Park (1904/05) was inaugurated. Where the Newark City Subway now runs along its western boundary, was The Morris Canal, a vestige of the once agricultural /canal barge way of life. It wasn’t until the early 1930s that the subway replaced the canal. He saw that come too—along with Newark Airport’s first planes. In 1906, the area where the skating rink now resides at the far southern edge of Branch Brook Park was a private water reservoir (one of a number around the city-another one was on South Orange Avenue between West Side High and the old Pabst Brewery. It’s condos now). 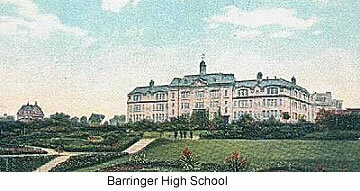 Barringer High School, founded in 1838 and widely believed to be the 3rd oldest high school in the USA, just next door to the rising Cathedral, was already almost 70 years old as Sabino’s fruit and vegetable wagon clippity-clopped past its Ridge Street entrance. His son Anthony would later become a beloved janitor there, and his grandchildren Sam, Dolores, and Harry would graduate from there in 1949, ’51, and ’66. Could he have imagined that? His oldest son Louis would attend Arts High to become the famous chief designer for legendary Lionel Trains, bringing unimaginable Christmas joy and smiles to generations of children and toy train enthusiasts. His son Luke would supervise shade tree crews throughout the city, and become a local golf legend at Hendrick’s Field in Belleville. His son Ernest won a Golden Gloves title---later to minister to the wounded at Anzio Beach and other WW II hell- holes on his ancestral soil in Italy. His son Anthony would land at Normandy and be seriously wounded. Uncle Sal made chocolate at the old Hooten’s factory and Uncle Mickey made those delicious cakes and pies at Dugan’s bakery. Luke’s son Sam, an accordion and musical prodigy, would later venture to Las Vegas to seek his fortunes, writing music for and performing with our nation’s greatest entertainers--- setting performance and longevity records along The Strip, ultimately helping that city evolve from a small sandy oasis to the fastest growing city in America. In 1906, the famous Thomas Edison was still very much alive, and highly productive in his West Orange Labs on Main Street. With trolleys along Clifton Avenue, and connections to Park Avenue likely, Sabino could have rode to the great inventor’s doorsteps in about 20-30 minutes. More than likely he read about his inventive exploits in the newspapers and probably started seeing and using some of the inventor’s products. In just the short span of time from about 1878 to Sabino’s 1904-1906 arrival, Edison had produced the electric light, the electric utility system, recorded sound, motion pictures, and radically improved Bell’s telephone with a carbon button microphone for greatly improved sound clarity. Surely Sabino partook of this largesse in his daily life. His grandson Harry as a young boy would worship the exploits of Edison, later becoming an inventor himself. Times were changing when Sabino came here. All the change he saw and the sights and sounds and smells of his ethnic enclave must have been quite frenetic compared to his rural Italian farming roots. It was a time when smokestacks were synonymous with progress and opportunity. Perhaps Sabino’s eyes stung with the dust and smoke in the air? Sure, Sabino’s dream was in Technicolor, just like it was for his grandson, but he saw people coming into the city, and his grandson saw them leave for the suburbs-all in a span of about 50 years. Nothing stands still in America, which I am sure Sabino learned when well-meaning urban planners in the early 1950s decided to bring high rise apartment buildings to Little Italy, and ironically named them the Christopher Columbus 1 apartments. Sabino’s eyes watered I am sure when he saw how these concrete monsters tore the heart out of his beloved community, destroying forever the birthplace of many Newark doctors, lawyers, teachers, engineers, politicians and congressmen, musicians, artists and nurses. I think Sabino’s eyes would smile now if he saw from the ashes of that failed experiment, the lovely single family homes that have been built and inhabited by a new generation of immigrants. You should see the roof these men put on my house.